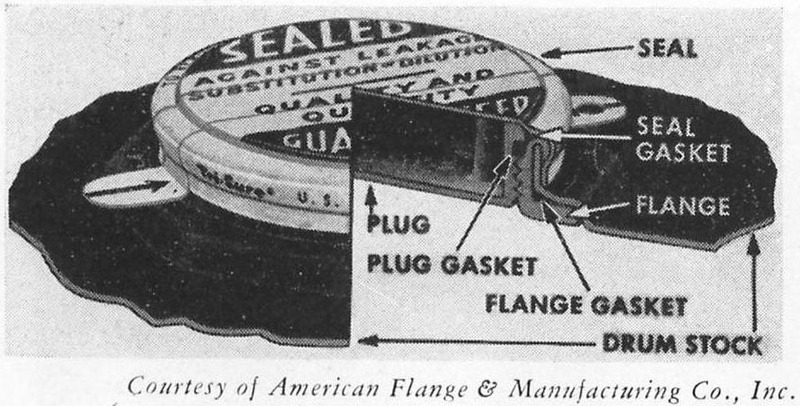 The container ends are attached to the body by double seams similar in construction to the side seam. However, a rubber-like sealing compound is inserted in each double seam as it is formed in order that the seams will be leak-proof after rolling down. Several types of rubber are used in the manufacture of these sealing compounds and the properties of each can be modified or enhanced by the incorporation of various compounding ingredients. The resistance of these sealing compounds to petroleum products varies considerably. The type of oil is particularly significant, and in some cases additive composition may also contribute to deterioration. There are numerous compounds available for these seams and it is essential that the correct material be selected for containers used to package specific products. Other conventional metal containers may differ from the one-quart can described in the foregoing paragraphs, in that they are larger, have removable lids, require heavier plate, use more viscous double seaming compounds or have welded side seams. In some instances a chemical treatment of the metal surface replaces the interior organic coatings. One of the most important differences is that the larger containers are equipped with a reclosing feature for the benefit of the customers in dispensing the product. The component parts of a typical closure are show in Figure 9. Each individual part of the closure must be resistant to attack or swelling in the presence of the packaged product. The closure itself must be leak-proof and provide an adequate seal against ingress of air or moisture. The selection of individual components for a single container for a new lubricating oil that has a composition similar to products packaged in the past, is relatively simple. On the other hand, when several types of containers are involved, and the composition of the new product is drastically different from those with which past experience has been gained, the process becomes more complicated. It is then necessary to determine the effect of each component of every container upon the product and conversely, the product upon each component. One significant factor to be considered in this regard is the abuse to which the filled containers may be subjected during handling and the possible resultant product contamination. In the case of the 55-gallon drum, hot rolled steel plate is used for its construction. Normally, plate of this type is covered with a brittle film of millscale that is likely to flake off into the product upon moderate deformation of the drum. As a means of preventing this contamination, the millscale may be removed during manufacture of the drum by some means such as acid pickling or shot blasting. This step is immediately followed by a chemical treatment that inhibits the surface against rust. Drums made from this type of plate have proven to be very satisfactory in service, and are gaining widespread usage for packaging petroleum products. In the case of smaller containers, care must be taken to select an interior coating that will not lose its flexibility and flake off into the product. Another important factor to be considered is the environmental conditions to which the packaged lubricants will be subjected. For example, they may stand for months in warehouses at elevated temperatures, or in the open, exposed to all sorts of weather conditions. Many seaming compounds that are otherwise satisfactory are deteriorated after a few weeks at higher temperatures. When the containers are stored in the open, moisture may enter through the closures during repeated dispensing of the product, and this may cause degradation of the interior coatings and seaming materials. All of these factors are considered in selecting container components for a new lubricant. To better illustrate the process of selecting suitable package components, the development of typical container specifications for a new lubricating oil product will be described. The first step is to determine the types of containers in which the product will be marketed. This decision is based upon the intended purpose of the lubricant and its expected volume of sale. An individual lubricating oil product may be marketed in several types of containers; however, since 55 and 5-gallon drums and 1-quart cans are the most widely used, it will be assumed that the new product will be marketed only in those packages. After this decision has been made, each container is considered on the basis of individual parts. The reaction of many container components with a new formulation can be reasonably predicted from past experience; however, this may not be true if the composition of the new product is drastically different. Accordingly, several different materials for each application are evaluated in a preliminary testing program. In a typical case, this usually involves 3 months storage of the materials in contact with the product at elevated temperatures. The package materials are observed for deterioration and complete tests are also obtained on the product at regular intervals throughout this period to check against possible quality degradation. Some of the materials studied in a typical screening program, together with the actual observed condition at the end of a preliminary storage program. This list of materials would be either expanded or reduced depending upon the number and types of containers to be used in marketing the product. From the data developed in preliminary programs of this type, tentative specifications are developed for each container. In this case, chemically treated plate was specified for the 55-gallon drum, because of the combination of its rust-resistant surface and freedom from millscale. An organic coating was therefore not required, and contamination of the product was therefore not required, and contamination of the product with flakes of millscale was eliminated. Cold rolled steel plate is universally used in combination with suitable organic coatings for small containers in the petroleum industry and is the proper selection in this case for the 5-gallon drum and 1-quart can. Since the 5-gallon drum is equipped with a reclosing feature through which air and moisture may enter during times that the product is being dispensed, an epoxy-phenolic coating was specified due to its moisture resistance and flexibility. The more economical oleoresinous coating was used for the 1-quart cans, since the product is entirely consumed after a single opening and moisture contamination is no problem. The seaming compounds and closures selected were unaffected in the presence of the product. This is always essential in order to avoid container leakage or contamination of the product with traces of moisture. After development of the tentative specifications, finished containers meeting these requirements are ordered for further testing. These containers are filled with the product and stored at both ambient and elevated temperatures. Containers equipped with reclosing features are also stored with products that have been saturated with water. During the course of the storage, a continuing check is made upon the quality of the product in order to confirm preliminary data developed with the single components. Other filled containers are “abuse tested” under the most extreme handling conditions, after which the interior services are examined for damage and the products observed for contamination. In the event a new type of closure is contemplated, extensive tests are conducted in order to determine its ability to prevent loss of product or moisture ingress over a wide range of temperature conditions. Although laboratory tests are useful in the development of a new lubricating oil formulation and the selection of components for the containers in which it will be marketed, field conditions often impose demands upon both the lubricant and the package that cannot be foreseen or duplicated in the laboratory. Therefore, before a new lubricant is marketed, it is tested under actual field conditions. The tentatively approved containers are used to package the product for this final test program, during which the performance of the containers is observed as critically as the lubricant itself.